Lt. Gov. Brian Calley signing the MiAble bill allowing those with disabilities to establish financial accounts to be used for care without jeopardizing federal funding. In my first term as lieutenant governor, I led the bipartisan and bicameral Mental Health and Wellness Commission. We took a comprehensive and expansive look at several aspects of life and society for those living with neurological differences, including mental illnesses, developmental disabilities or substance use disorders. This work focused on health care, education, employment, stigma and more. It was meant to be a start to creating a Michigan that worked better for all people. Lt. Gov. Brian Calley with Special Olympics medalists from Michigan in the Capitol. In recent weeks, the federal government’s financial support of Special Olympics has been the subject of debate. It has been several years since the state formed a partnership of its own with Special Olympics of Michigan, so I wanted to take this opportunity to describe the benefits of this important public private partnership. Inclusion is not a luxury; it is essential for learning. It wasn’t that long ago when students with neurological differences were segregated as a go-to strategy for their education. Thankfully, times have changed. Today, there is an expectation and a requirement in both state and federal law that students be integrated into mainstream classrooms as much as possible. We know from our past that separate is not equal. But still, just putting a student in a classroom is not real inclusion. For a student to truly be a part of society (and for a kid that means school life) we need to be intentionally inclusive both in the classroom and out. After much research and analysis, we found a best practice right in our backyard: Special Olympics’ Project Unify. Project Unify gives students with developmental disabilities a real chance to participate in sports and other school activities alongside their peers. In our research at the time and in the results since then, we’ve seen cultures of inclusion develop as we seek to create a generation that makes a place for everyone. Someday, each of these students will become adults. Those who were being excluded are learning age-appropriate social behaviors and neuro-typical students are learning how to be more inclusive. It is our hope that they will carry that knowledge into their communities and workplaces later on. With very modest support from the state, Project Unify is active in 247 Michigan schools in 99 districts. Their presence has grown each year since the partnership began and all schools participate on a voluntary basis. Lt. Gov. 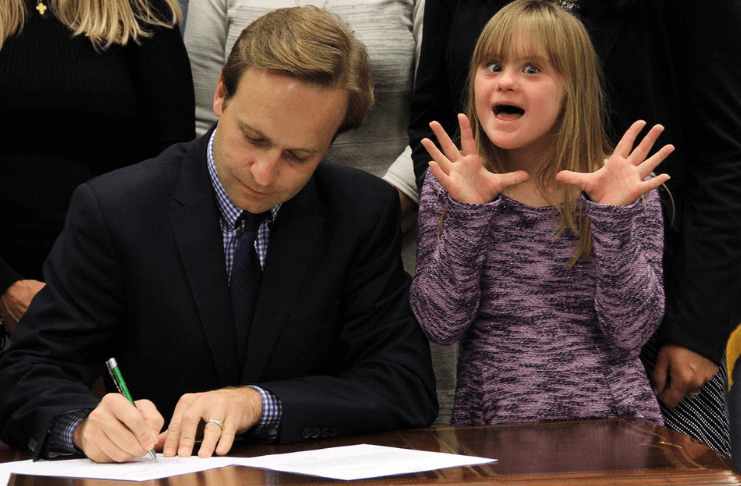 Brian Calley signing the “R Word” legislation removing and replacing the word “retarded” with “developmental or intellectual disability” in Michigan law and on forms. Special Olympics of Michigan is the inclusion expert. By forming a partnership with them, the state was able to jumpstart inclusion efforts, make use of the experience and expertise of Special Olympics personnel, and leverage private sector philanthropy together with local school contributions. Everyone won. Had the state and/or schools tried to recreate these results without Special Olympics, it would have cost much more. And even then, it is doubtful we would have made anywhere near as much progress. It’s tempting to see a line item like this in the state budget and think of it as an extra, as some have argued. It is not. For so many children across our state, it is their ticket to the what most of us take for granted — access to the world. Brian Calley is president of the Small Business Association of Michigan (SBAM). He served as Michigan lieutenant governor from 2011 to 2019 and shepherded the state’s autism coverage law. Prior to that, he served as the Republican state representative for the 87th District from 2007 to 2011. He is currently in the process of joining the board of Special Olympics Michigan.